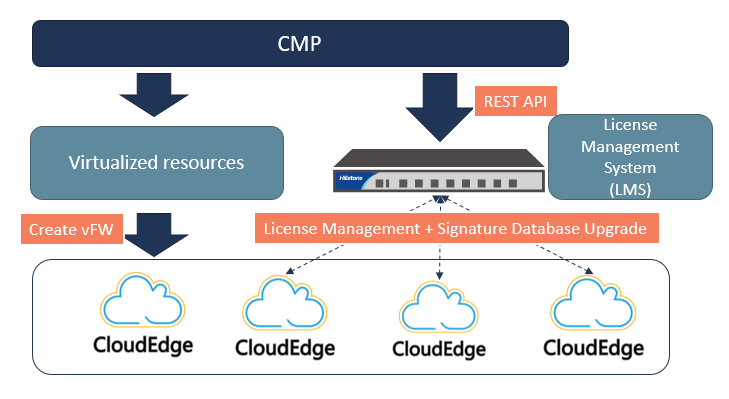 Today, Hillstone released a new version of the hardware-based License Management System (LMS), with enhanced license management capabilities, as well as the ability to update signature for CloudEdge and integrate with third-party CMPs. Hillstone LMS currently has been applied in network to manage hundreds of CloudEdge instances. With this version 3.0 update, LMS greatly improves the overall breadth of operation and management for administrators. Convenient license management: LMS 3.0 supports license batch import, and detects license import to prevent incorrect import and reduce risk. Fully automated life-cycle management with flexible distribution settings: License policy can be configured based on IP and host name to implement a targeted license delivery; the policy manual distribution allows admin to set the recycling time to achieve auto license recycling; admin can set the global automatic delivery policy to implement the default automatic delivery and delivery type settings.